The City of Fort Lauderdale is introducing a series of new ordinances that will effectively ban sleeping or having property in public spaces, panhandling, and sharing food. These rules will create even greater levels of suffering for the 500+ homeless people in Broward County who will not have any safe places to be, no way to eke out a living, and no food aid. We need compassionate people from South Florida and beyond to resist these laws! January 31st marked exactly 3 months since the beginning of the sharing ban. While the status quo of downtown remains mostly unaltered, a number of people affected by the law spent the anniversary in one spotlight or another. In West Broward, Chef Arnold, Pastor Dwayne Black, Pastor Frank Pontillo (accepting on behalf of Rev. 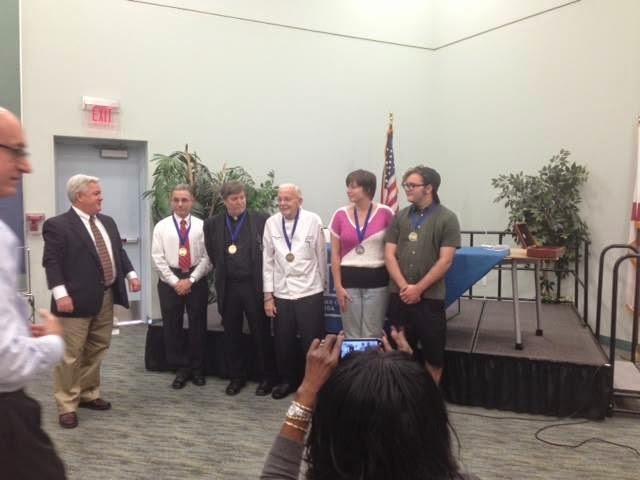 Mark Sims), and Nikki & Damien from Food Not Bombs received "civil liberty arrest medals from the Broward ACLU. Homeless advocates also put together a rally downtown to shine a light on the underdog candidates running for Fort Lauderdale City Commission next month. Didier Ortiz, running for District 3, and Chris Brennan, running for Mayor, both spoke. Mayor Jack Seiler, Earl Rynerson, Donna Guthrie, Phil McKinzie, Dean Trantalis, and David Tabb all chose not to come. It seemed like at least one or two candidates seemed uncomfortable with attending a rally in collaboration with the "homeless hate law resisters." Oh well. Of interest in the next week or two is the expiration for the sharing ban injunction set shortly before Christmas. Although legal opinions seem somewhat varied, without further court rulings, it is possible the sharing ban could be enforced again starting next week, although highly unlikely due to the upcoming elections.Stay tuned. Sign the Petition: "Fort Lauderdale, Don't Criminalize Homelessness"
Awesome Inc. theme. Theme images by TrapdoorMedia. Powered by Blogger.